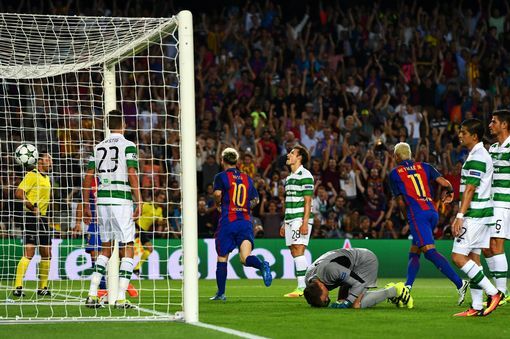 Lionel Messi hit a hat-trick as Celtic’s Champions League campaign began with a 7-0 defeat to Barcelona in the Nou Camp. The Argentina forward took less than three minutes to open the scoring and after Moussa Dembele missed a penalty at the other end, he added a second before half-time. Neymar made it three with a free-kick shortly after the restart and after Andres Iniesta got the fourth, Messi completed his treble and Luis Suarez netted a double too. The defeat leaves Celtic bottom of Group C with Manchester City still to play Borussia Monchengladbach on Wednesday after their match was called off because of heavy rain.